Our Consultants — Draft Day Consultants, Inc.
Denny is owner of Draft Day Consultants, Inc., and a fantasy football writer and analyst for DailyFantasyCafe.com and TheFakeFootball.com. Carter's fantasy writing has been featured in The New York Times and he cohosts the Living The Stream podcast. Carter created the fantasy points per route run (FPPRR) metric with Rich Hribar. Rich is a longtime fantasy football gamer in multiple formats and full time obsessive. As a fantasy meteorologist, he is a re-draft writer for Rotoworld. Hribar's study of game flow and fantasy scoring is widely considered to be groundbreaking work in fantasy circles. Nathan, a University of South Florida-St. Petersburg graduate, has been an avid fantasy football owner since childhood and began writing for industry publications in 2013. He writes for Dynasty League Football and does a variety of re-draft and daily fantasy analysis for Rotoballer. Nathan specializes in dynasty roster building. Pat is a lead writer for Pro Football Focus Fantasy. He has more than 20 years of fantasy football experience, and has successfully advised independently owned fantasy teams for a decade. Pat was named the Fantasy Sports Writers Association 2013 Newcomer of the Year. He also took down the 2013 FSWA Industry Insiders League, comprised of over 120 fantasy experts. Scott is a writer and analyst at RotoViz.com and has more than 20 years of fantasy football experience. Scott has won numerous championship over the years and believes in using numbers and advanced metrics to exploit weaknesses in any fantasy format. Especially interested in the wide receiver and tight end positions, Scott developed the catch radius measurement and fantasy footprint and continues to study statistics in search of the perfect predictive model. Dave is a writer for RotoViz and the founder of FFDraftPrep.com. He’s known for building powerful fantasy football tools and has spent thousands of hours creating draft/mock draft programs. As a result, he places significant emphasis on draft strategy, roster construction and game theory. As a CPA with a background in financial analysis, Dave is comfortable with condensing large volumes of information into actionable advice. He focuses on tailoring approaches to league settings/tendencies and is well versed in adapting strategies on the fly. Jeff's a Senior Writer & podcast host for Dynasty League Football. He's been published on Rotoworld, TwoQBs, Sportable, numberFire, and in Football Diehards’ Fantasy Football Pro Forecast print publication. Known for his off-kilter writing style & Twitter presence, Jeff's at his best talking strategy, as his biggest edges are found in market exploitation & taking advantage of the errant thinking of others. With a wealth of experience in salary cap, dynasty, 2QB, redraft, DFS, auction, & high stakes leagues, Jeff has been around the fantasy world. Jason has over a decade of fantasy football experience, and has been writing about sports since he was old enough to hold a pen. He writes Fantasy football and DFS content for numberFire, as well as DFS content for Fantasy Insiders. With experience in traditional redraft leagues, DFS, MFL10s, dynasty, devy, and IDP leagues, there is no fantasy football format he won't dive into. Joe is an NFL Analyst for numberFire.com, where he uses analytics to test the myths and narratives of football. He is the owner of Dynasty Think Tank, an up-and-coming platform for college football scouting and research, and is the author of the only Dynasty rookie draft guide solely for Individual Defensive Players (IDP). Joe's fantasy football specialties are Dynasty leagues, IDP, and particularly deep roster formats. He is a member of the Fantasy Sports Writers' Association (FSWA). Ryan is a dynasty writer for Dynasty League Football and Rotoworld, specializing in evaluating player value, building young, but competitive teams through startup draft and auctions, and formulating consolidation trades in order to gain top-end talent. Ryan is also a commissioner of multiple dynasty leagues and has created several new dynasty formats and unique league rules. Mike Braude is the owner and operator of Apex Fantasy Football Money Leagues. Mike started playing fantasy sports at the age of 10 and began writing about fantasy football in 2011 while completing a Bachelor’s degree at the University of Arizona. He writes strategic articles on RotoViz and the Apex Insider blog. After years of playing in many competitive high stakes and expert leagues, Mike specializes in position scarcity and roster construction. Josh Hermsmeyer is the creator of airyards.com and air yards based metrics RACR and WOPR. His analysis has been published on Rotoviz, Rotoworld, Rotounderworld, and he authored the chapter on Wide Receivers in the upcoming Rotoworld Draft Book. He is the co-host of The Numbers Game and has created a class on wide receiver air yards at Rostercoach. Josh has appeared as a guest on Fantasy Feast with Evan Silva and Ross Tucker, Dynasty Blueprint with Matt Williamson and Ryan McDowell, and RotoUnderworld with Matt Kelley. Alex Gelhar joined the NFL in 2012 and has been a full-time fantasy football writer since the 2014 season. As the editor for the NFL Fantasy staff the last few years, Alex spearheaded the hiring of talented writers to expand the content offerings at NFL.com and provide readers with more in-depth, insightful analysis than was previously available on the site. His analysis can be found on NFL.com, the NFL Fantasy LIVE podcast, and past episodes of "NFL Fantasy LIVE" on NFL Network. Peter Overzet is a contributor at Rotoviz.com, the host of the Fantasyland podcast, and the producer of the Pete Manzinelli YouTube channel. He has played fantasy football for over 10 years, including high stakes FFPC leagues and a variety of keeper and dynasty leagues. Chris Allen is writer, editor, and analyst for Fantasy Football Couch Coach and the co-host of the A Fantasy Fan Sportscast. He has used analytics to test weather effects and its impact on games, player output variance, and the validity of the associated narratives. The collected data has helped Chris identify overall market inefficiencies allowing him to specialize in estimating player value. Leveraging his multiple years of experience across different formats (e.g. seasonal redraft, DFS, MFL10), Chris highlights his skill in roster construction and overall game theory in drafts. Matt is an NFL analyst for numberFire. He has been playing fantasy football since the playing days of Rich Gannon and Eddie George. His work focuses on both fantasy football and sports betting. He often finds links between the two and uses them to his advantage. He has plenty of experience in redraft and 2-QB leagues. Blair Andrews is the Managing Editor at RotoViz, where he writes The Wrong Read, a weekly column that explores some of the more theoretical aspects of fantasy football strategy and player evaluation. He is also the co-host of the Fantasy Football Report on RotoViz Radio. The only thing he knows for sure is that his projections are definitely wrong. Therefore his draft strategy is to construct teams that have the best chance to succeed in spite of massive prediction error. Tim is a dynasty writer for Under the Helmet and co-hosts the Under The Helmet podcast. He concentrates on developing an owner strategy and helps owners create a team-building tool kit to build winning teams. Tim provides a wealth of experience in dynasty and redraft. 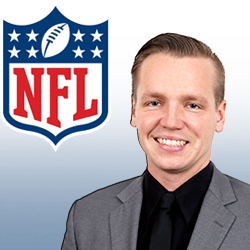 Scott Fish has been working in the fantasy football industry since 2005, becoming a full-time employee in 2017, running MFL10s and the SafeLeagues commissioner service. He's one of the most well known commissioners and is known for his unique leagues. Scott hosts the Bull Rush Podcast, Commissioner Impossible Podcast, and co-hosts the syndicated Fantasy Football Weekly show on KFAN in Minnesota. Scott used to be known for pushing developmental (devy) leagues into prominence. Now most people know him for his famous ScottFishBowl tournament that pits hundreds of fans and analysts against one another. But wait, there's more! Scott also runs a charity called Fantasy Cares. Each year he runs leagues for that cause that bring in thousands of dollars for toys for tots.